It’s best to choose fruit that is organic or spray-free. Manmade chemical pesticide sprays are foreign to the human body and thus require huge amounts of energy to deal with. Because our immune system is expending energy getting rid of these chemicals to protect our vital organs, it has less time to do its other daily chores such as fighting bugs, viruses, allergens, and clearing out old cellular debris. If this still hasn’t put you off – these chemicals which act like estrogens also increase cellulite and excess belly fat. It’s a great idea to eat seasonally so we are in-sync with the natural rhythms of nature. Mother nature always knows best! In the spring she produces loads of fresh greens to help alkalize and “spring clean” our systems after winter hibernation, and in the summer she hands out cooling and hydrating cucumbers, watermelons, zucchinis and berries. Eating with the seasons also means the fruit and veg can fully ripen and thus be at their highest nutrient count and full of flavour (rather than being picked early so they can be shipped across the world without going bad). I especially love choosing seasonal produce as it keeps meals interesting and varied. Combine all the crumble ingredients together with your hands, massaging the mixture together with your hands ensures everything is well mixed. 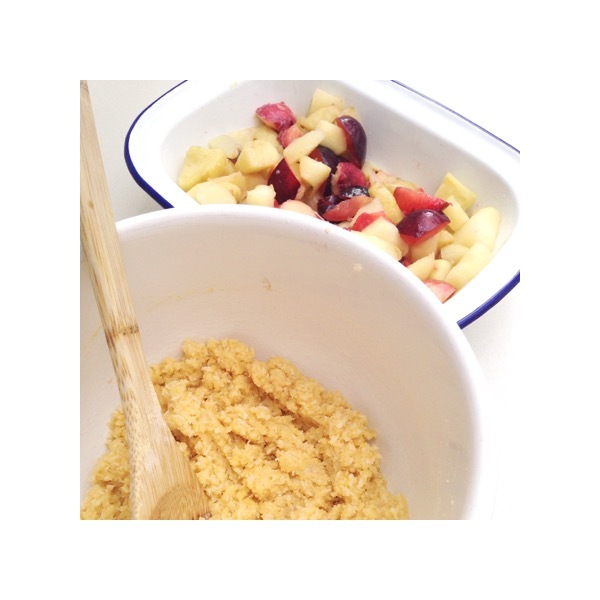 A great tip from Hemsley + Hemsley is to place the crumble mix in the fridge to harden it for a better crispy texture. Add the sliced fruit to the baking pan, giving it a good stir to make sure the different fruits are well mixed. Using your hands again, crumble the dry mixture over the fruit then press down well to seal the fruit in like you would a pie. Place in the oven and cook for 45 minutes. Turn the grill on for the last five minutes for a definite crispy topping! If you can bear waiting before serving, I sometimes turn the oven off but leave the crumble inside the oven for another 10-15 minutes – this makes for exceptionally gooey tasty fruit! I love this crumble as is, or with my plum cream, but I know a lot of people love it drenched in double cream! Other delicious accompaniments are nut butters, greek yoghurt, coconut cream or coconut yoghurt. Enjoy!